Like Ra, his peer from the north, Amun was identified as the sun god who created the universe and was the source of all life. In his most elemental form he can be found in the creation myth of Hermopolis (see Chapter Ten, “Thoth and Maat”), where he and his female partner, Amunet, represented the air, as two of the group of gods who gave shape to the world. Eventually Nun, the primeval ocean, was absorbed into the concept of Amun, perhaps (in the view of Siegfried Morenz) because the people preferred a system of creation in which there was both a specific act of creation and a divine figure, such as Amun, responsible for it. As a national god, Amun was believed to have important political duties as protector of the king and guarantor of success against enemies. A fragment from the period of the Ramesside kings tells of the earlier attempts of the Hyksos king Apohis to disrupt the empire of the Theban ruler Seknenre (the entire manuscript was perhaps intended to advance Amun-Ra’s prestige). Apohis, a follower of Seth, observed that Seknenre relied only on Amun-Ra, king of the gods, and he designed a test of the god s power and willingness to protect his prince. Apohis sent a messenger to Seknenre complaining that the nightly noises of the hippopotamuses in a nearby canal kept him awake and he asked the king to see that he got some sleep. Unfortunately the king’s solution to the problem was lost along with the rest of the manuscript, but Amun’s responsibilities for his earthly kingdom are clear. from the reign of Thutraose III. Earlier the king had defeated Joppa (modern Jaffa), but later the city rose up in rebellion. Thutmose sent his general Djehuty to retake the city, and the general arranged to parley with the rebel leader outside the city. Once alone with the rebel, Djehuty took his king’s cane, which he had brought into battle, and smote the man on the forehead while testifying aloud that Thutmose’s strength came from Amun. Once the leader had been captured, Djehuty set about taking the city. He deceivingly sent word to the city that Djehuty had fallen and was delivering tribute. Djehuty’s soldiers then hid in two hundred baskets that were to be taken to the city as peace offerings. 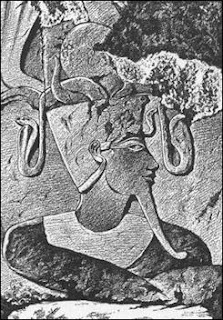 Amun was usually depicted as a ram with curved horns, a man with a ram’s head, or a man with two upright plumes as a headpiece. Herodotus explained how this association with the ram came about in a myth that also explained the meaning of the name Amun-the “Hidden One.” The Greek traveler claimed that the Egyptians had told him a story in which Khons wanted to see what his father looked like, but Amun was reluctant to grant this special favor even to his own son. Amun had heretofore hidden his appearance from everyone, but when Khons persisted with his request, Amun devised a trick to satisfy the son and still not reveal all his secrets. He skinned a ram and cut off its head. Just before showing himself to Khons, he covered himself with the skin and put the ram’s head in front of his own face. All the young god saw was the likeness of a ram. According to Herodotus, this myth explained why Egyptians revered and refused to sacrifice the ram, except once a year when, in celebration of this story, they killed one ram and used the skin to clothe a statue of Amun just before it was revealed to a statue of Khons.